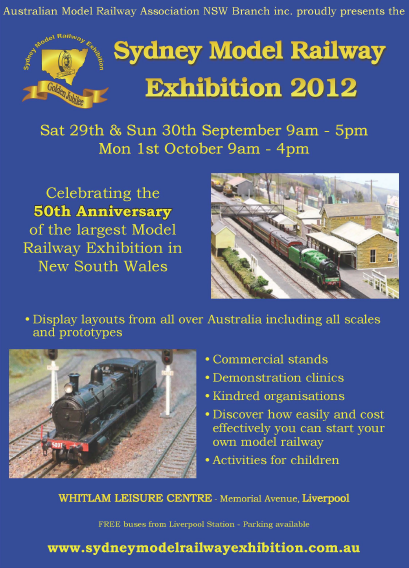 Last week, for the first time since my last visit in 2010, I went to the annual Sydney Model Railway Exhibition. As before, it was still good fun. Some layouts that I remembered from last time were there, as well as some new ones. A few weeks ago when I first considered this visit, I re-read my previous post about my last visit and it made me smile for several reasons. On one hand, watching model trains going around is still very calming, amazing layouts are still a wonder to behold, and as always I admire great craftsmanship and attention to detail. On the other hand, though, I never got around to regularly going to other exhibition and club open-days – last week’s visit was the first I’d made since 2010. There are the usual excuses and reasons – forgetfulness, laziness and other things suddenly coming up. As well, though, around that time I had something else very much on my mind – my crumbling finances that would lead to my voluntary bankruptcy a few months later. In fact, several hours after visiting the 2010 Exhibition, I went to a DA meeting. Every now and then during the past two years I thought about getting back into visiting exhibitions, but I never did. A few weeks ago, however, I decided that enough was enough and that it was time to go back, and I’m glad that I did. And visiting last week’s Exhibition has given me an idea. I don’t think I’ll get into model-railroading as an active enthusiast – but there is a related hobby that I can get active in. As I mentioned in my post about the 2010 Exhibition, I was very impressed by a large LEGO layout that was there – and at the time and a few times afterwards, I gave serious thought about perhaps joining the group that built it. Seeing their layout at the 2012 Exhibition inspired me again to think about joining them – but this time, I have something to bring to the table. As I’ve written about previously, this year I’ve gotten back into LEGO-building. I don’t consider myself a master-builder, but I can build – and any excuse to do more is welcome. As well, enquiring about membership in that group will finally get me to do something that I had planned to do since getting back into LEGO-building but still haven’t gotten around to doing – taking photos of my LEGO creations. This entry was posted in Happiness, Inspiration, Life is Good, Life Strategies. Bookmark the permalink.